Sgraffito is a technique in which layers of colored slips or underglazes are applied to a piece and then different layers are scratched off to create a pattern or picture or reveal a contrast in color underneath. With this piece we rolled out a slab of clay, layed it over top a foam tray and cut off the excess. Then I coated the top of mine with red underglaze. After the underlgaze dried I carved away all the parts of the tray I didn't want to be red. Finally I waxed the bottom of the clay tray and dipped it into a bucket of glaze for it to be later fired in the glaze kiln. The finished product wasn't exactly what I had hoped it would be. I'm not very fond of the contrast in color between the white and red glaze. I also don't like how streaky the red underglaze turned out. 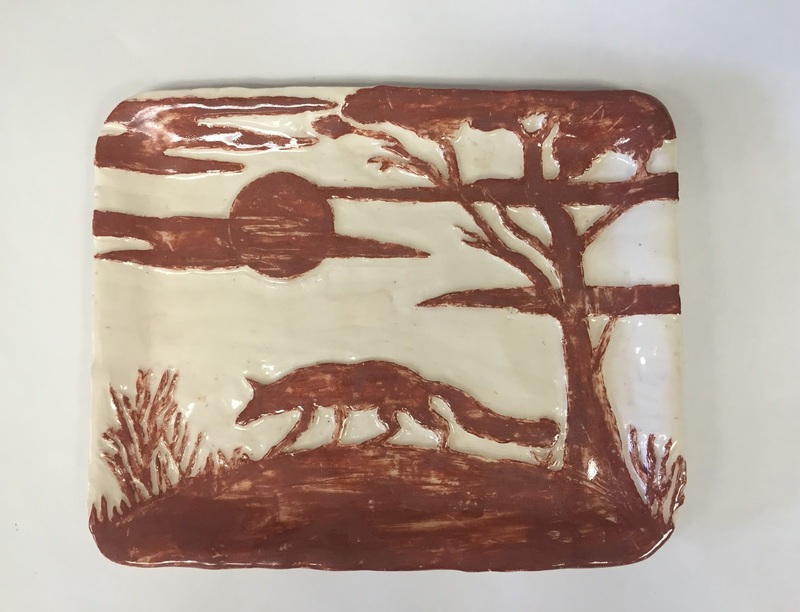 If I were to do this project again I would keep more red in the picture and put a thicker coat of underglaze on top. Maybe the picture I chose to carve was a little too complex but I think the concept of this piece is very very cool and I would love to do another tray. This project was a good reminder of how including relief can create so much more dimension allow creativity to transpire in your piece.